Whether we're talking about a #novel, a short #story, or even narrative non-fiction, I agree with Stephen King when he defines writing as telepathy ... because writing is the art of transferring ideas from one brain to another. 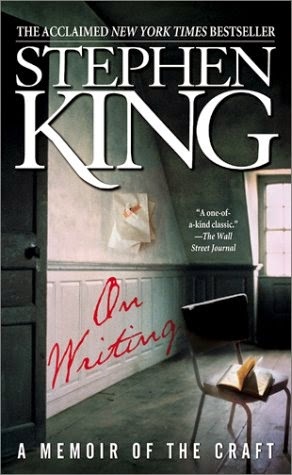 Much of material for this post is paraphrased from pages 95-99 in Stephen King’s book ON WRITING: A MEMOIR OF THE CRAFT. The writer does not even have to be in the same room as the reader for the telepathy to occur. I could write a story while sitting at my antique desk, next to the window overlooking my garden, at my home in Nampa. Then I could then mail those written words to you. At which point, you could recline in your favorite chair at your house and read those written words. That’s when you would receive my transmitted message. If I’ve mastered the craft of writing, I can transfer images from my mind to your mind. We don’t have to be in the same place or even the same time period. I could have written those words years ago. You could read them today. And the telepathy would still happen. Let’s give it a try. Right here. Right now. I walk down a narrow hallway to a kitchen at the back of the house. Sunshine streams through the sliding glass doors, brightening the entire room. A crimson cotton tablecloth drapes over a round kitchen table, and on top of that table sits a tall, wire bird cage. At the bottom of the cage is a fluffy, white rabbit. Its pink nose twitches as it munches away on a stub of a carrot. On the rabbit’s back, clearly marked in blue ink, is the number 8. The rabbit pauses for a moment, completely motionless, but then just as suddenly, he begins chomping on his carrot again. Did we see the same thing? Of course there will be variations. Color blind receivers probably saw a dark gray tablecloth instead of a red one. Some decorative souls may have added a scalloped edge along the tablecloth. When it comes to the bird cage, I’m certain there were more variations, because I only gave you a rough description of the cage. The alternative would have been to give you exact measurements such as 41 inches tall with a circumference of 26 inches. And that would have been more like an instruction manual than a narrative. So while some of you may have seen a three foot tall cage and others saw a five foot tall cage, the point is, you saw a cage with a rabbit at the bottom of it. Which brings us to the important part of this telepathy exercise ... while there may have been variations with the details of the transmission … one thing should have been perfectly clear in your mind: the blue number 8 on the back of the rabbit. And even more important than the blue 8 is the question that I transmitted to your mind without using any words at all. The question I planted was: Why is there a blue number 8 on the back of that carrot munching rabbit? If that question did not cross your mind, either I’ve not mastered the art of transmitting or you’ve not mastered the art of receiving. In which case, one of us did not take this seriously. In order for writing to work like telepathy, the writer must master the art. A writer must transmit a clear picture to the mind of the reader. These two people do not have to be in the same room or even the same time period for this to work. It is not magic or accidental. Writing is a form of telepathy, but only if the writer takes the craft seriously and masters it.